The most powerful Hall thruster the world has ever seen showed its mettle at NASA Glenn. A side shot of the X3 firing at 50 kilowatts. Photo credit: NASA. 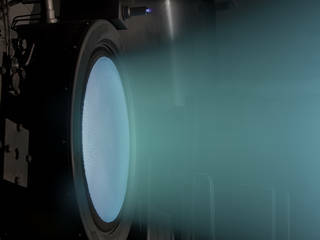 An advanced space engine in the running to propel humans to Mars has broken the records for operating current, power and thrust for a device of its kind, known as a Hall thruster. 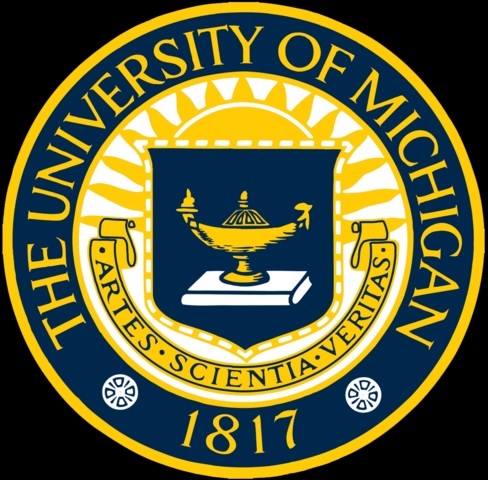 The development of the thruster was led by University of Michigan Aerospace Engineering Professor Alec D. Gallimore, who is also the Robert J. Vlasic Dean of Engineering. 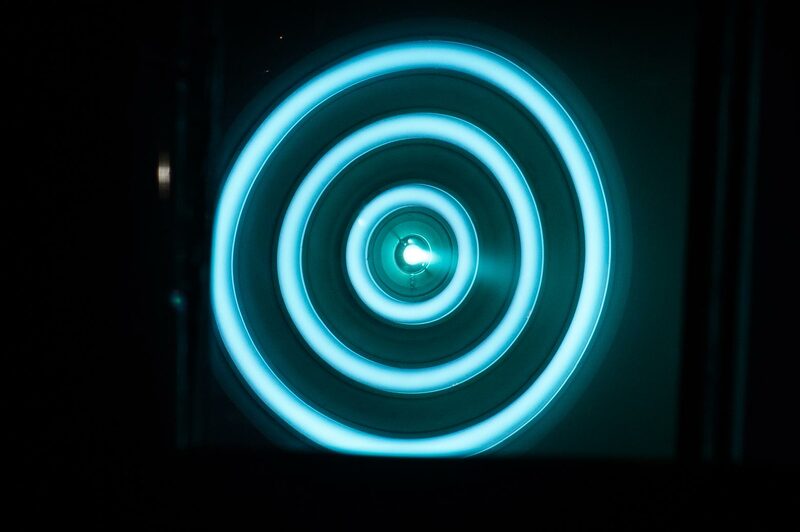 A head-on shot of the thruster firing at 50 kilowatts, viewed through a warped mirror in the vacuum chamber. Photo credit: NASA. The challenge is to make them larger and more powerful. 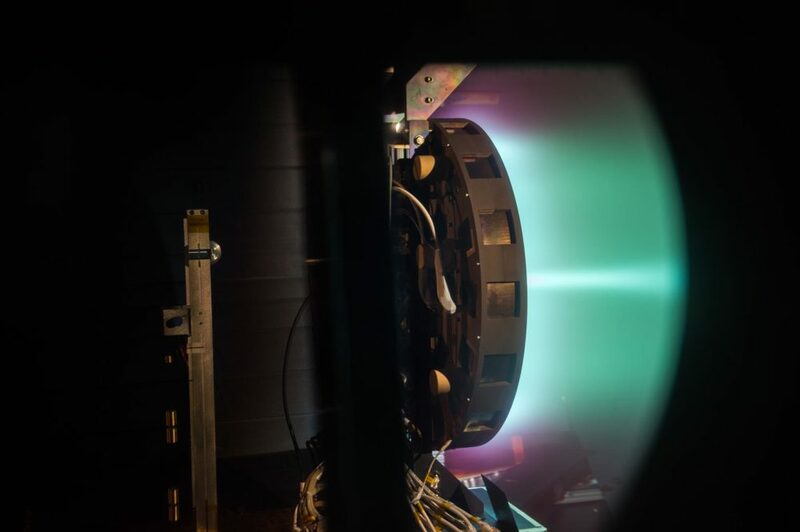 The X3, a Hall thruster designed by researchers at U-M, NASA and the US Air Force, shattered the previous thrust record set by a Hall thruster, coming in at 5.4 newtons of force compared with 3.3 newtons. The improvement in thrust is especially important for crewed mission: it means faster acceleration and shorter travel times. The X3 also more than doubled the operating current record (250 amperes vs 112 amperes) and ran at a slightly higher power (102 kilowatts vs 98 kilowatts). The X3 is one of three prototype “Mars engines” to be turned into a full propulsion system with funding from NASA. Scott Hall, a doctoral student in aerospace engineering at U-M, carried out the tests at the NASA Glenn Research Center in Cleveland, Ohio, along with Hani Kamhawi, PhD, a NASA Glenn research scientist who has been heavily involved in the development of the X3. The experiments were the culmination of more than five years of building, testing and improving the thruster. 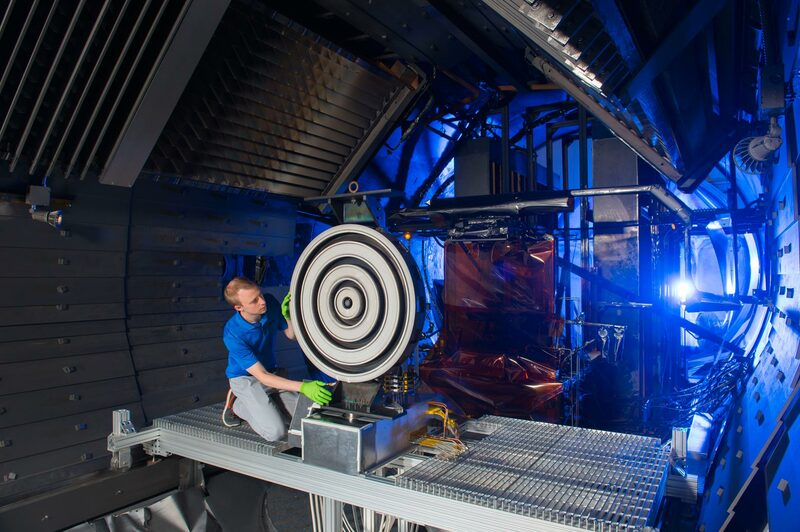 NASA Glenn, which specializes in solar electric propulsion, is currently home to the only vacuum chamber in the US that can handle the X3 thruster. The thruster produces so much exhaust that vacuum pumps at other chambers can’t keep up. Then, xenon that has been shot out the back of the engine can drift back into the plasma plume, muddying the results. But as of January 2018, an upgrade of the vacuum chamber in Gallimore’s lab will enable X3 testing right at U-M.
For now, the X3 team snagged a test window from late July through August this year. Hall loaded the X3 into a 26-foot moving truck and drove it down to Cleveland in February. There, he and Kamhawi – supported by a team of NASA researchers, engineers and technicians – began a painstaking inspection of the X3, dismantling it and examining the parts one by one. One of the issues they uncovered and fixed was a propellant leak in the thruster, which would have reduced its thrust in the tests. In late May, Hall and Kamhawi began to reassemble the X3 and prepare it for its turn in the vacuum chamber. Once the timer started rolling on their test, they had four weeks to set up the thrust stand, mount the thruster and connect it to xenon and electrical power supplies. Hall had built a custom thrust stand to bear the X3’s 500-pound weight and withstand its force, as existing stands would collapse under it. Throughout the process, Hall and Kamhawi were supported by NASA researchers, engineers and technicians. “The big moment is when you close the door and pump down the chamber,” said Hall. After the 20 hours of pumping to achieve a space-like vacuum, Hall and Kamhawi spent 12-hour days testing the X3 from seven in the morning to seven at night. Even small breakages feel like big problems when it takes days to gradually bring air back into the chamber, get in to make the repair, and pump the air back out again. But in spite of the challenges, Hall and Kamhawi brought the X3 up to its record-breaking power, current and thrust over the 25 days of testing. When problems arose, Hall would consult Dean Gallimore over the phone. 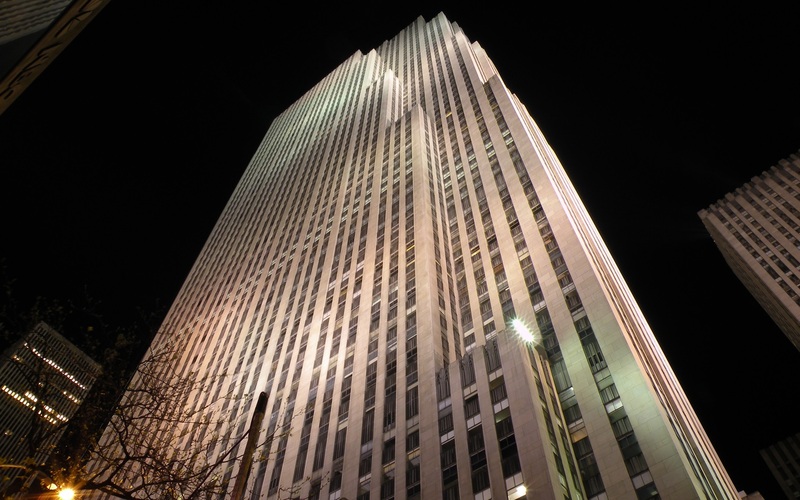 “Alec is so clear and level-headed. I would go to him with my head in my hands, thinking something terrible had happened. But he always believes we are going to be fine, and we always are,” said Hall. Scott Hall makes some final adjustments on the thruster before the test begins. Photo credit: NASA. Looking ahead, the X3 will at last be integrated with the power supplies under development by Aerojet Rocketdyne, a rocket and missile propulsion manufacturer and lead on the propulsion system grant from NASA. In the spring of 2018, Hall expects to be back at NASA Glenn running a 100-hour test of the X3 with Aerojet Rocketdyne’s power processing system. The X3 is designed to run at double its current power of 100 kilowatts, but making the leap to 200 kilowatts is outside the scope of the current project. As for the competing designs for that future Mars mission, Hall says he’s heard rumors around NASA, but he hasn’t seen any published results that he can compare to the X3’s new stats. The project is funded through NASA’s Next Space Technologies for Exploration Partnership, which supports not just propulsion systems but also habitat systems and in-space manufacturing. Dean Gallimore is also the Richard F. and Eleanor A. Towner Professor, an Arthur F. Thurnau Professor, and a professor of aerospace engineering and applied physics. Kamhawi is also Hall’s NASA mentor as part of the NASA Space Technology Research Fellowship. The $1 million upgrade of the test facility in Gallimore’s lab is funded in part by the Air Force Office of Scientific Research, with additional support from NASA’s Jet Propulsion Laboratory and U-M.
New origin story could explain mystery of Red Planet’s makeup. Mars may have had a far-out birthplace. Simulating the assembly of the solar system around 4.56 billion years ago, researchers propose that the Red Planet didn’t form in the inner solar system alongside the other terrestrial planets as previously thought. Mars instead may have formed around where the asteroid belt is now and migrated inward to its present-day orbit, the scientists report in the June 15 Earth and Planetary Science Letters. The proposal better explains why Mars has such a different chemical composition than Earth, says Stephen Mojzsis, a study coauthor and geologist at the University of Colorado Boulder. Mars, like Mercury, is a runt of the inner solar system, weighing in at only about a ninth of Earth’s mass. One of the reigning theories of planetary formation, the Grand Tack model, blames Jupiter for the Red Planet’s paltry size. In that scenario, the newly formed Jupiter migrated toward the sun until it reached Mars’ present-day orbit. A gravitational tug from Saturn then reversed Jupiter’s course, sending the gas giant back to the outer solar system (SN: 4/2/16, p. 7). Gravitational effects of Jupiter’s sunward jaunt acted like a snowplow, scientists believe, causing a pileup of material near where Earth’s orbit is today. The bulk of that material formed Venus and Earth, and the scraps created Mercury and Mars. This explanation predicts that all the terrestrial planets formed largely from the same batch of ingredients (SN: 4/15/17, p. 18). But studies of Martian meteorites suggest that the Red Planet contains a different mix of various elements and isotopes, such as oxygen-17 and oxygen-18, compared with Earth. Planetary scientist Ramon Brasser of the Tokyo Institute of Technology, Mojzsis and colleagues reran the Grand Tack simulations, keeping an eye on the materials that went into Mars’ creation to see if they could explain the different mix. As with previous studies, the researchers found that the most probable way of creating a solar system with the same planet sizes and positions as seen today is to have Mars form within Earth’s orbit and migrate outward. However, this explanation failed to explain Mars’ strikingly different composition. Another possible scenario, though seen in only about 2 percent of the team’s new simulations, is that Mars formed more than twice as far from the sun as its present-day orbit in the region currently inhabited by the asteroid belt. Then as Jupiter moved sunward, its gravitational pull yanked Mars into the inner solar system. Jupiter’s gravity also diverted planet-making material away from Mars, resulting in the planet’s relatively small mass. With Mars forming so far from the planetary feeding frenzy responsible for the other rocky planets, its composition would be distinct. While this scenario isn’t as likely as Mars forming in the inner solar system, it at least matches the reality of Mars’ makeup, Mojzsis says. Such a distant origin means that the fledgling Mars would have received far less sunlight than originally thought, a challenge to early Mars’ possible habitability. Without a sustained thick atmosphere of heat-trapping greenhouse gases, the planet would have been too cold to sustain liquid water on its surface for long periods of time, Mojzsis argues. Though large meteorite impacts could have temporarily warmed Mars above freezing, the planet wouldn’t have had a consistently warm and wet youth similar to that of the early Earth, he says. Confirming whether Mars really was born that far out in space will require taking a closer look at Venus’ mix of elements and isotopes, which the researchers predict would be similar to Earth’s. Venus’ composition is largely unknown because of a lack of Venusian meteorites found on Earth, and that mystery won’t be unlocked anytime soon: No missions to Venus are planned. The Martian atmosphere is a decimated shred of what it once was, thanks to the fact that a disappearing magnetic field allowed solar winds to pummel the red planet’s skies over millions of years. So naturally, one solution to making Mars more habitable may be to resurrect its magnetosphere — and it’s a crazy idea NASA scientists are actually looking into. At Wednesday’s Planetary Science Vision 2050 Workshop at the NASA headquarters in Washington, D.C., NASA’s Planetary Science Division Director Jim Green spoke about how this magnetic shield would work. A planet’s magnetic field is a barrier against solar winds that can do serious damage to the atmosphere. A robust atmosphere that keeps a planet warm enough and pressurized enough to sustain liquid surface water will be stripped away by solar winds in a relatively short time. As the atmosphere goes, so does the water — which is precisely what is thought to have happened to Mars a long time ago. NASA’s idea involves implementing a magnetic dipole shield consisting to Mars L1, an orbit between Mars and the sun. This shield, which would generate an artificial magnetic field, could reduce solar wind stripping and radiation, as well as restore Mars’s atmosphere, making it more balanced and suitable for humans. “Perhaps one-seventh of the ancient ocean could return to Mars,” Green said. In addition, this shield could possibly create an environment to melt the water in Mars’s polar caps. However, the team still needs to do further testing. About 3.5 billion years ago, Mars had a significant amount of water, and the planet was covered in lakes and running rivers. But after rapid climate change, the planet is now desolate. The planet has extreme temperatures, sometimes reaching as high as 170 degrees Fahrenheit and as low as minus 195 degrees Fahrenheit, as well as pressure waves throughout the day. Over its history, Mars lost 85 to 90 percent of its atmosphere. Right now, most of its atmosphere is carbon dioxide, while oxygen leaves the atmosphere and is carried away by solar winds. This chart shows the five most abundant gases in Mars’ atmosphere. Noimage credit. The research team conducted atmospheric simulations of Mars to see how the magnetic shield would affect Mars’s climate, including over extreme solar wind events. They found that increasing the magnetic dipole would stop solar wind stripping. However, increasing the surface pressure doesn’t have a large effect on Mars’s global temperature and it increases dust in the atmosphere. But in some cases, the equator heats up and the polar caps collapse, causing CO2 ice caps grow and stabilizing Mars’ climate. To continue with the research, the team plans to continue modeling Mars’s climate to look at radiative effects of ice clouds and trace gases. However, Green believes we can change Mars to have a similar climate to Earth. Don’t miss!!! On Monday, May 30, Mars will be closer to Earth than it has been in 11 years and it will shine 10 times brighter than it did at the start of 2016. Last week on May 22, Mars reached opposition with the sun, meaning the Earth was between Mars and the Sun, but that phenomena did not mark Mars’ closest approach to Earth. On May 30, Mars Will be 47.2 million miles (75.3 million kilometers) from Earth, that’s more than 500,000 miles closer to our planet than at opposition. So, it is a great opportunity to stargazer to catch a glimpse of Mars as will appear bigger and brighter than usual to us until June 3. Mars is easy to view with the naked eye, you don’t need a telescope or binoculars to see it, probably you will be able to find it easily without a star chart or an astronomy app. said Slooh astronomer Bob Berman in a statement. In 2018, the next time their orbits line up, Mars and the Earth will be even closer, 36 million miles. The modern-day record, 34.6 million miles, was set in 2003. That won’t be surpassed until the year 2287 – that was the nearest Earth and Mars have been in almost 60,000 years according to NASA. Robin Scagell, vice-president of the Society for Popular Astronomy, said to skynews. Mars is now quite large in the sky, about 18 seconds of arc across (0.3 degrees). It looks very red because it’s so low in the sky, scraping the rooftops really. If you want to see some detail you need a telescope with 75 – 100 times magnification. The best time to see it is around 1am. Saturn is next to Mars at the moment and you can see the difference between the two planets. Saturn looks yellowish. Don’t miss this close approach of Mars thus you’ll have to wait until July of 2018 !!! Mars has held a central place in human imagination and culture for millennia. Ancients marveled at its red color and the brightness that waxed and waned in cycles over the years. Early observations through telescopes led some to speculate that the planet was covered with canals that its inhabitants used for transportation and commerce. In “The War of the Worlds”, the writer H.G. Wells posited a Martian culture that would attempt to conquer Earth. In 1938, Orson Welles panicked listeners who thought they were listening to a news broadcast rather than his radio adaptation of Wells’s novel. The real story of humans and Mars is a little more prosaic but no less fascinating. Telescopes turned the bright red dot in the sky into a fuzzy, mottled disk that gave rise to those daydreams of canals. Just 50 years ago, the first photograph of Mars from a passing spacecraft appeared to show a hazy atmosphere. Now decades of exploration on the planet itself has shown it to be a world that once had open water, an essential ingredient for life. The fascination hasn’t waned, even in the Internet Age. A former computer programmer named Andy Weir, who enjoyed writing for its own sake and posted fiction to his blog, started a serial about a NASA astronaut stranded on Mars. The popularity ultimately led him to turn it into a successful novel, “The Martian”, which has been made into a movie that will be released in October 2015. “The Martian” merges the fictional and factual narratives about Mars, building upon the work NASA and others have done exploring Mars and moving it forward into the 2030s, when NASA astronauts are regularly traveling to Mars and living on the surface to explore. Although the action takes place 20 years in the future, NASA is already developing many of the technologies that appear in the film. On the surface of Mars, Watney spends a significant amount of time in the habitation module — the Hab — his home away from home. Future astronauts who land on Mars will need such a home to avoid spending their Martian sols lying on the dust in a spacesuit. At NASA Johnson Space Center, crews train for long-duration deep space missions in the Human Exploration Research Analog (HERA). HERA is a self-contained environment that simulates a deep-space habit. 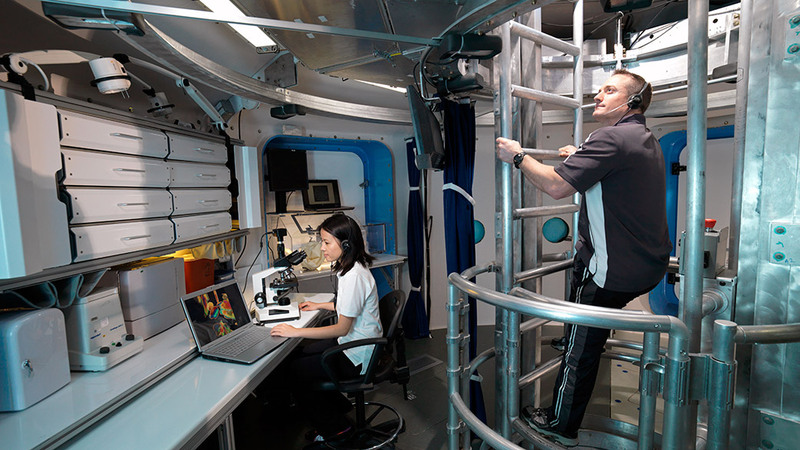 The two-story habitat is complete with living quarters, workspaces, a hygiene module and a simulated airlock. Within the module, test subjects conduct operational tasks, complete payload objectives and live together for 14 days (soon planned to increase to up to 60 days), simulating future missions in the isolated environment. Astronauts have recently used the facility to simulate ISS missions. These research analogs provide valuable data in human factors, behavioral health and countermeasures to help further NASA’s understanding on how to conduct deep space operations. Today, astronauts on the International Space Station have an abundance of food delivered to them by cargo resupply vehicles, including some from commercial industries. On Mars, humans would not be able to rely on resupply missions from Earth – even with express delivery they would take at least nine months. For humans to survive on Mars, they will need a continuous source of food. They will need to grow crops. 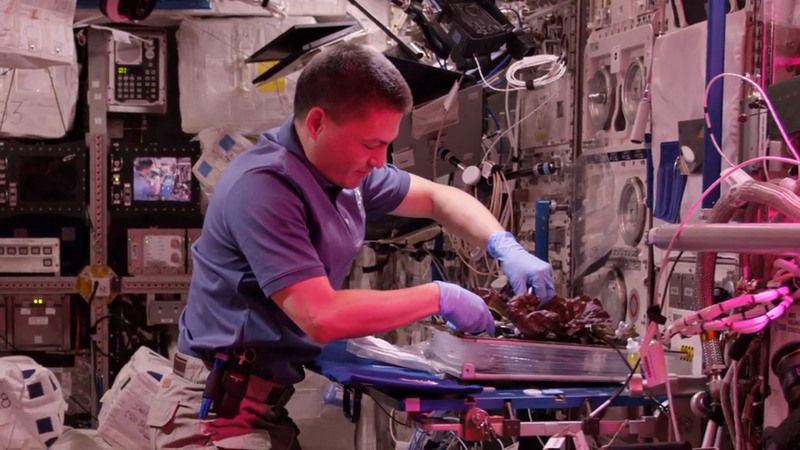 Real-life NASA Astronaut Kjell Lindgren harvests lettuce grown from the Veggie experiment while on board the International Space Station. 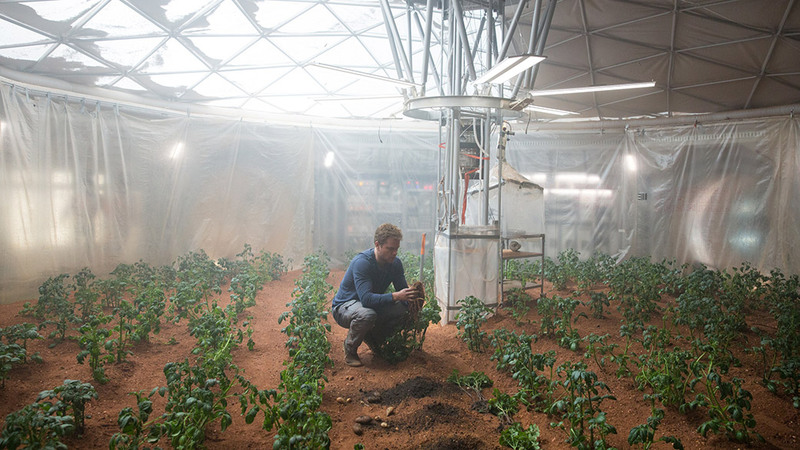 Watney turns the Hab into a self-sustaining farm in “The Martian,” making potatoes the first Martian staple. Today, in low-Earth orbit, lettuce is the most abundant crop in space. Aboard the International Space Station, Veggie is a deployable fresh-food production system. Using red, blue, and green lights, Veggie helps plants grow in pillows, small bags with a wicking surface containing media and fertilizer, to be harvested by astronauts. In 2014, astronauts used the system to grow “Outredgeous” red romaine lettuce and just recently sampled this space-grown crop for the first time. This is a huge step in space farming, and NASA is looking to expand the amount and type of crops to help meet the nutritional needs of future astronauts on Mars. There are no lakes, river or oceans on the surface of Mars, and sending water from Earth would take more than nine months. Astronauts on Mars must be able to create their own water supply. The Ares 3 crew does not waste a drop on Mars with their water reclaimer, and Watney needs to use his ingenuity to come up with some peculiar ways to stay hydrated and ensure his survival on the Red Planet. Liquid presents some tricky problems in space. The WRS and related systems have to account for the fact that liquids behave very differently in a microgravity environment. The part of the WRS that processes urine must use a centrifuge for distillation, since gases and liquids do not separate like they do on Earth. NASA is continuing to develop new technologies for water recovery. Research is being conducted to advance the disposable multifiltration beds (the filters that remove inorganic and non-volatile organic contaminants) to be a more permanent component to the system. Brine water recovery would reclaim every drop of the water from the “bottoms product” leftover from urine distillation. For future human-exploration missions, crews would be less dependent on any resupply of spare parts or extra water from Earth. The technology behind this system has been brought down to Earth to provide clean drinking water to remote locations and places devastated with natural disasters. Food, water, shelter: three essentials for survival on Earth. But there’s a fourth we don’t think about much, because it’s freely available: oxygen. On Mars, Watney can’t just step outside for a breath of fresh air To survive, he has to carry his own supply of oxygen everywhere he goes. But first he has to make it. In his Hab he uses the “oxygenator,” a system that generates oxygen using the carbon dioxide from the MAV (Mars Ascent Vehicle) fuel generator. On the International Space Station, the astronauts and cosmonauts have the Oxygen Generation System, which reprocesses the atmosphere of the spacecraft to continuously provide breathable air efficiently and sustainably. The system produces oxygen through a process called electrolysis, which splits water molecules into their component oxygen and hydrogen atoms. The oxygen is released into the atmosphere, while the hydrogen is either discarded into space or fed into the Sabatier System, which creates water from the remaining byproducts in the station’s atmosphere. Oxygen is produced at more substantial rate through a partially closed-loop system that improves the efficiency of how the water and oxygen are used. NASA is working to recover even more oxygen from byproducts in the atmosphere to prepare for the journey to Mars. The Martian surface is not very welcoming for humans. The atmosphere is cold and there is barely any breathable air. An astronaut exploring the surface must wear a spacesuit to survive outside of a habitat while collecting samples and maintaining systems. Mark Watney spends large portions of his Martian sols (a sol is a Martian day) working in a spacesuit. He ends up having to perform some long treks on the surface, so his suit has to be flexible, comfortable, and reliable. NASA is currently developing the technologies to build a spacesuit that would be used on Mars. Engineers consider everything from traversing the Martian landscape to picking up rock samples. The Z-2 and Prototype eXploration Suit, NASA’s new prototype spacesuits, help solve unique problems to advance new technologies that will one day be used in a suit worn by the first humans to set foot on Mars. Each suit is meant to identify different technology gaps – features a spacesuit may be missing – to complete a mission. Spacesuit engineers explore the tradeoff between hard composite materials and fabrics to find a nice balance between durability and flexibility. One of the challenges of walking on Mars will be dealing with dust. The red soil on Mars could affect the astronauts and systems inside a spacecraft if tracked in after a spacewalk. To counter this, new spacesuit designs feature a suitport on the back, so astronauts can quickly hop in from inside a spacecraft while the suit stays outside, keeping it clean indoors. Once humans land on the surface of Mars, they must stay there for more than a year, while the planets move into a position that will minimize the length of their trip home. This allows the astronauts plenty of time to conduct experiments and explore the surrounding area, but they won’t want to be limited to how far they can go on foot. Astronauts will have to use robust, reliable and versatile rovers to travel farther. In “The Martian,” Watney takes his rover for quite a few spins, and he even has to outfit the vehicle with some unorthodox modifications to help him survive. On Earth today, NASA is working to prepare for every encounter with the Multi-Mission Space Exploration Vehicle (MMSEV). The MMSEV has been used in NASA’s analog mission projects to help solve problems that the agency is aware of and to reveal some that may be hidden. The technologies are developed to be versatile enough to support missions to an asteroid, Mars, its moons and other missions in the future. NASA’s MMSEV has helped address issues like range, rapid entry/exit and radiation protection. Some versions of the vehicle have six pivoting wheels for maneuverability. In the instance of a flat tire, the vehicle simply lifts up the bad wheel and keeps on rolling. Slow and steady wins the race, and ion propulsion proves it. In “The Martian,” the Ares 3 crew lives aboard the Hermes spacecraft for months as they travel to and from the Red Planet, using ion propulsion as an efficient method of traversing through space for over 280 million miles. Ion propulsion works by electrically charging a gas such as argon or xenon and pushing out the ions at high speeds, about 200,000 mph. The spacecraft experiences a force similar to that of a gentle breeze, but by continuously accelerating for several years, celestial vessels can reach phenomenal speeds. Ion propulsion also allows the spacecraft to change its orbit multiple times, then break away and head for another distant world. This technology allows modern day spacecraft like NASA’s Dawn Spacecraft to minimize fuel consumption and perform some crazy maneuvers. Dawn has completed more than five years of continuous acceleration for a total velocity change around 25,000 mph, more than any spacecraft has accomplished on its own propulsion system. 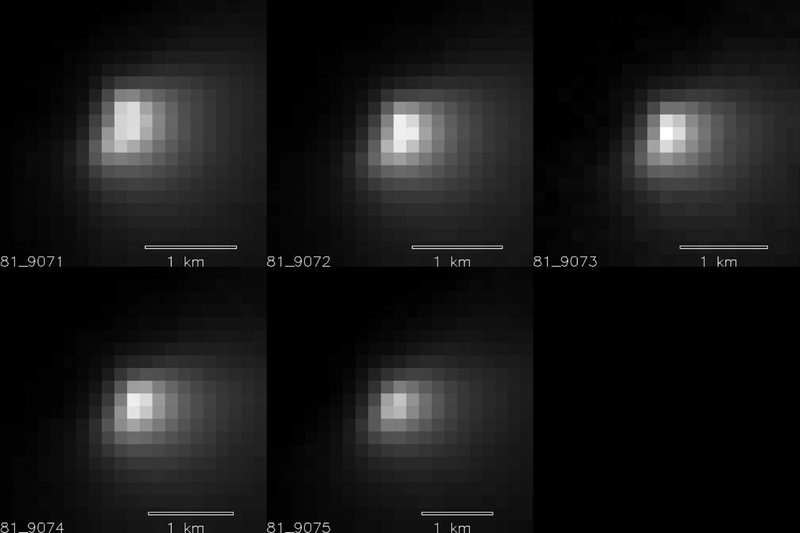 Along the way, it has paid humanity’s first visits to the dwarf planet Ceres and the asteroid Vesta. There are no gas stations on Mars. No power plants. Virtually no wind. When it comes to human missions to the Red Planet, solar energy can get the astronauts far. The Hermes spacecraft in the book uses solar arrays for power, and Mark Watney has to use solar panels in some unconventional ways to survive on Mars. On the International Space Station, four sets of solar arrays generate 84 to 120 kilowatts of electricity – enough to power more than 40 homes. The station doesn’t need all that power, but the redundancy helps mitigate risk in case of a failure. 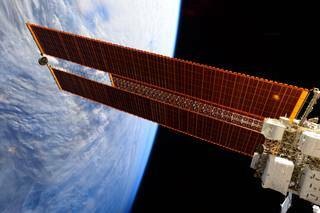 The solar power system aboard the space station is very reliable, and has been providing power safely to the station since its first crew in 2000. Orion, NASA’s spacecraft that will take humans farther than they’ve ever gone before, will use solar arrays for power in future missions. The arrays can gather power while in sunlight to charge onboard lithium-ion batteries. In case no sunlight is available – for instance, if Orion were to go behind the Moon – there would still be plenty of power to allow it to operate. For more than four decades, NASA has safely used Radioisotope Thermoelectric Generators (RTGs) to provide electrical power for two dozen space missions, including Apollo missions to the Moon. Spacecraft such as the Mars rover Curiosity and the upcoming Mars 2020 rover use an updated, next-generation model for electrical power. RTGs are “space batteries” that convert heat from the natural radioactive decay of plutonium-238 into reliable electrical power. The RTG on Curiosity generates about 110 Watts of power or less – slightly more than an average light bulb uses. 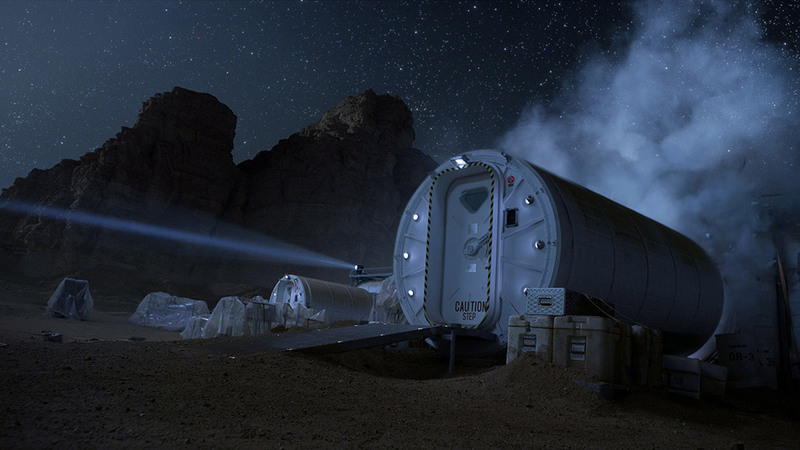 In “The Martian,” the crew buries the plutonium-based RTG power source for the Mars Ascent Vehicle far away from the Hab in case of radioactive leakage. To prevent any leak, as suggested in the movie, Plutonium-238 has several layers of strong, advanced materials that protect against release even in severe accidents. The RTG mostly emits alpha radiation, which can only travel a few inches in the air and does not penetrate clothing or human skin. It could only affect human health if it were broken into very fine particles or vaporized, and inhaled or ingested. The isotope is manufactured in a ceramic form, so accidentally inhaling or ingesting it is unlikely, particularly as it does not dissolve in liquids. In reality, the natural radiation environment on Mars is more extreme than the radiation produced from an RTG. Ionizing radiation raining down on Mars from space is far more hazardous to human health. Current Mars missions are analyzing the Martian radiation environment so that mission planners can design protection systems for future astronauts. Future explorers will need assured, reliable and durable power sources for survival in place before they arrive. Power system options might include a mix of more efficient radioisotope power systems, solar power, fuel cells, and nuclear fission. Human spaceflight is a dangerous business. NASA is working to send humans to Mars in the 2030s, but there are many milestones to accomplish to ensure that astronauts come back to Earth safely. Astronaut Scott Kelly, currently aboard the International Space Station for one year, put it perfectly: space is hard. The margin for error is virtually zero for every aspect of spaceflight. However, we learn so much along the journey to Mars that furthers our understanding of the universe, and everything we do and learn is brought right back to Earth to benefit humanity. A one-way trip to Mars sounds like something you’d wish on your worst enemy — so why would more than 78,000 people from around the world pay up to $75 for a chance to die on another planet? As a master of hard science fiction, the 62-year-old Brin knows better than most applicants what the first Red Planet settlers would face if they’re sent off in 2022, as the Dutch-based Mars One venture has proposed. The settlers would have to be sealed up in habitats, protected from harsh radiation, supplied with machine-made air and water, and nourished by whatever food can be grown on a cold, barren planet. They’d have to keep their sanity, millions of miles away from their families and Mission Control. Worst of all, they’d have to face the fact that there’s no guarantee of ever going back. Nevertheless, the venture has an attraction for Brin and tens of thousands of others, The ages of those listed in Mars One’s database range from 18 to 71. All those applicants are facing a long road even before the first four-person crew gets off the planet. Mars One is accepting applicants through Aug. 31. The field of applicants would first be whittled down by panels of experts. Then they’d undergo trial by reality TV, followed by years of training. On the other end of the age spectrum, 71-year-old psychiatrist Sanford Pomerantz is a little surprised that it’s taking this long to get something like Mars One off the ground. “I thought by now we would have colonized Mars,” said Pomerantz, who’s currently the oldest applicant on Mars One’s list. Brin sees Mars One as just one of a number of ventures aimed at expanding humanity’s frontier, ranging from Virgin Galactic’s suborbital space tours to Golden Spike’s moon missions. “It’s emblematic of the new era that we’re about to enter at long last — what I call the barnstorming era,” he said. Like the daring airplane fliers of the 1920s, these 21st-century space barnstormers are willing to take bigger risks in hopes of providing bigger thrills — and eventually, earning bigger payoffs. The Mars One project is “a great way to get the discussion going,” Brin said. Brin doesn’t doubt that Mars One will find plenty of qualified (and interesting) people willing to take the risk. Even if it means dying on alien soil? Brin isn’t completely sure he’d go that far, but he’s willing to bet that others would. “I think you’ll find tens of thousands of people who, under those circumstances, will at least ponder it seriously,” Brin said. McArthur, a freshman at the University of Arizona, is one of more than three dozen 18-year-olds on Mars One’s list of applicants. Ever since she applied, she’s been hearing that she has her whole life ahead of her, so why would she want to leave it all behind for Mars? She has long dreamed of going into outer space, and she figures that her future degree in materials science would come in handy for creating the first interplanetary settlement. “Going to Mars, there are so many opportunities for that,” she said. So far, her family hasn’t stood in her way. “My family jokes, like, ‘Oh, Kayli, have your fun with it,'” she said. If the selection process gets more serious, she suspects she might face more resistance from her parents. But not from her grandfather. Pomerantz is old enough to remember when the idea of sending people into outer space seemed as far out as the idea of sending people on a one-way trip to Mars seems now. One of the books that made an impression on him in grade school was Robert Heinlein’s “Red Planet: A Colonial Boy on Mars,” which was published in 1949. “I started as a physics major in the university, but then I got accepted into med school and changed directions,” he said. At the age of 71, he’s still a practicing psychiatrist in Topeka, Kan. But he’s also still holding onto that boyhood dream of spaceflight. “The Mars thing is exciting, because I hope it’ll stimulate people to get interested in space. 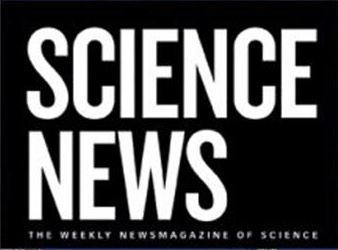 … And I hope it has the secondary effect of stimulating science education, especially in the U.S.,” he said. The Dutch-based Mars One venture says it’s winnowed down its list of applicants to 50 men and 50 women who will compete for the chance to take a one-way trip to Mars. Yes, that’s the reward — not the punishment. The Mars One project plans to put on a reality-TV competition to select 24 prospective crew members for missions to Mars, starting as early as 2024. Winners would be expected to start up a permanent colony on the Red Planet. Thousands signed up for Mars One consideration in 2013, and the 100 competitors (full list here) were chosen after going through interviews with chief medical officer Norbert Kraft. 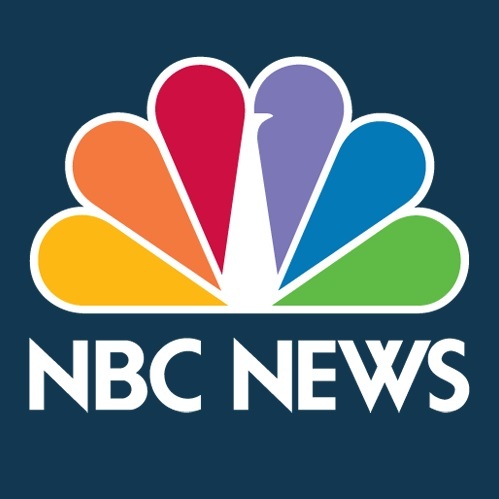 “Being one of the best individual candidates does not automatically make you the greatest team player, so I look forward to seeing how the candidates progress and work together in the upcoming challenges.” Kraft said in a news release issued Monday. Mars One estimates that it will need billions of dollars to conduct its Mars missions, including a robotic rover mission planned for launch in 2018. The money question is the biggest unknown right now, but last year an MIT study concluded that the venture’s plan to send humans to Mars and keep them alive was “overly optimistic” on technical grounds. But weather forecasting on the Red Planet is likely to be even trickier than on Earth. Weather, which changes day-to-day due to constant fluctuations in the atmosphere, and climate, which varies over decades, are familiar. More recently, a third regime, called “macroweather,” has been used to describe the relatively stable regime between weather and climate. A new study by researchers at McGill University and UCL [University College <London] finds that this same three-part pattern applies to atmospheric conditions on Mars. The results, published in Geophysical Research Letters, also show that the sun plays a major role in determining macroweather. The research promises to advance scientists’ understanding of the dynamics of Earth’s own atmosphere – and could provide insights into the weather of Venus, Saturn’s moon Titan, and possibly the gas giants Jupiter, Saturn, Uranus and Neptune. The scientists chose to study Mars for its wealth of data with which to test their theory that a transitional “macroweather” regime exists on other planets. They used information collected from Viking – a Mars lander mission during the 1970s and 1980s — and more recent data from a satellite orbiting Mars. By taking into account how the sun heats Mars, as well as the thickness of the planet’s atmosphere, the scientists predicted that Martian temperature and wind would fluctuate similarly to Earth’s – but that the transition from weather to macroweather would take place over 1.8 Martian days (about two Earth days), compared with a week to 10 days on Earth. The findings also indicate that weather on Mars can be predicted with some skill up to only two days in advance, compared to Earth’s 10 days. With some 300 buildings, more than 38,500 students and 250,000 living alumni, and a reputation for excellence that reaches around the globe, McGill has carved out a spot among the world’s greatest universities. Founded in Montreal, Quebec, in 1821, McGill is a leading Canadian post-secondary institution. 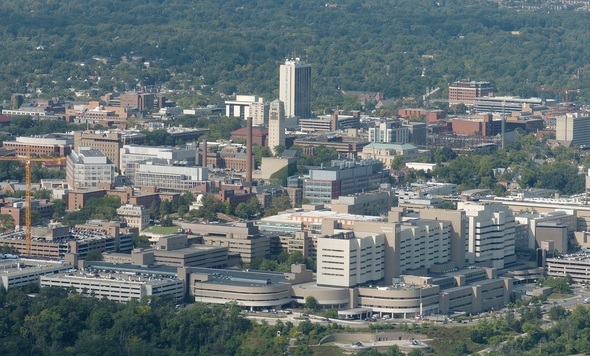 It has two campuses, 11 faculties, 11 professional schools, 300 programs of study and some 39,000 students, including more than 9,300 graduate students. McGill attracts students from over 150 countries around the world, its 8,200 international students making up 21 per cent of the student body. A rare close encounter between Mars and a comet last month pummeled the Red Planet with cometary dust, which likely left a yellow glow in the Martian sky, scientists revealed today (Nov. 7). Scientists studying the Oct. 19 Mars flyby of Comet Siding Spring said they were shocked at the amount of dust the comet showered down on the Red Planet. While it’s too early to say exactly how much dust the comet actually dumped, early estimates peg it at about a few thousand kilograms, according to Nick Scheider, a lead scientist for a dust-measuring instrument used in the study. A compass and scale image for Comet Siding Spring and Mars was made from the photo by Hubble Space Telescope of the comet flying by the red planet. Green said models of the flyby underestimated the size of the comet’s dust tail and overestimated how much it would spread out before reaching Mars. NASA positioned its satellites behind Mars to protect them from the dust. In October, NASA scientist Michelle Thaller told Space.com that the dust particles could be traveling at speeds reaching 100,000 mph (27,777 km/h). The scientists using the High Resolution Imaging Science Experiment (HiRISE) camera, an instrument aboard the Mars Reconnaissance Orbiter, announced a refined value for the size of the comet’s nucleus — the solid, central portion made of rock and ice — of 1.2 miles (2 km), which is smaller than expected. The falling dust particles, just like meteors in Earth’s atmosphere, burn up as they go down, so the shower would have created a brilliant light show for anyone standing on Mars at the time. Different elements can create different colors when they burn, and Schneider said it is likely the sky would have had a distinctly yellow glow, due to high levels of sodium. Schneider is instrument lead for the Imaging Ultraviolet Spectrograph, aboard the MAVEN spacecraft, which is the newest NASA satellite to arrive at Mars. The instrument also detected iron, zinc, potassium, manganese, nickel and chromium. The most noticeable difference in the composition of the dust, compared with the Martian atmosphere, was an overwhelming presence of magnesium. The Mars Reconnaissance Orbiter’s Shallow Subsurface Radar (SHARAD) spacecraft showed the effects of the dust on the Martian atmosphere. The SHARAD maps the Martian surface by sending radar blips from its orbit down to the ground. 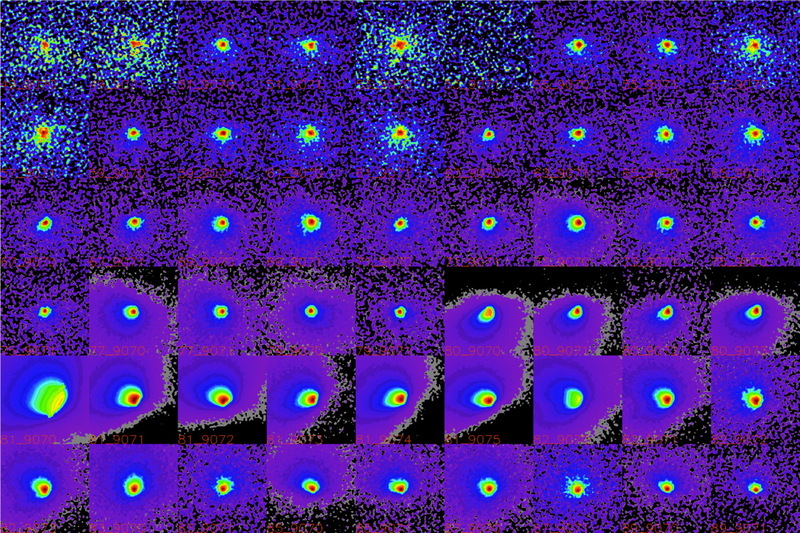 The image above shows the surface created by SHARAD, both before (top) and after (bottom) the dust shower. The dust clearly obscured the signals, making its surface image significantly blurrier. False color images of Comet Siding Spring as it neared Mars, taken by the High Resolution Imaging Science Experiment (HiRISE) camera aboard the Mars Reconnaissnce Orbiter. The plus side of the overwhelming dust shower is that now NASA scientists have a trove of data to sift through, which will hopefully answer questions about the comet and its origins. Comet Siding Spring is from a region called the Oort Cloud, a massive ring of icy bodies beyond the orbit of Neptune. Green said scientists believe this is comet Siding Spring’s first trip to the inner solar system. The farthest point of its orbit may be 50,000 times the distance from the Earth to the sun, or about 1 light year. Siding Spring is also a remnant of the earliest days of the solar system, and living in such an icy environment may have helped preserve it. If scientists can analyze the comet, they may unlock new secrets from those early days of our local cosmic home. NASA’s Mars Atmosphere and Volatile Evolution (MAVEN) spacecraft has provided scientists their first look at a storm of energetic solar particles at Mars, produced unprecedented ultraviolet images of the tenuous oxygen, hydrogen, and carbon coronas surrounding the Red Planet, and yielded a comprehensive map of highly-variable ozone in the atmosphere underlying the coronas. The spacecraft, which entered Mars’ orbit Sept. 21, now is lowering its orbit and testing its instruments. MAVEN was launched to Mars in November 2013, to help solve the mystery of how the Red Planet lost most of its atmosphere. Solar energetic particles (SEPs) are streams of high-speed particles blasted from the sun during explosive solar activity like flares or coronal mass ejections (CMEs). 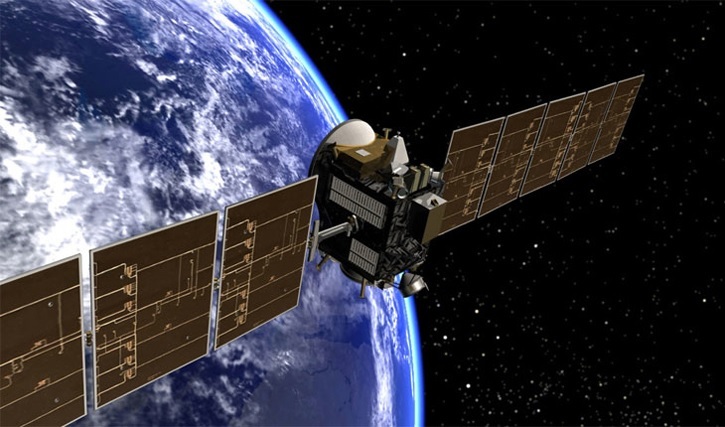 Around Earth, SEP storms can damage the sensitive electronics on satellites. At Mars, they are thought to be one possible mechanism for driving atmospheric loss. A solar flare on Sept. 26 produced a CME that was observed by NASA satellites on both sides of the sun. Computer models of the CME propagation predicted the disturbance and the accompanying SEPs would reach Mars on Sept. 29. MAVEN’s Solar Energetic Particle instrument was able to observe the onset of the event that day. The hydrogen and oxygen coronas of Mars are the tenuous outer fringe of the planet’s upper atmosphere, where the edge of the atmosphere meets space. In this region, atoms that were once a part of carbon dioxide or water molecules near the surface can escape to space. These molecules control the climate, so following them allows us to understand the history of Mars over the last four billion years and to track the change from a warm and wet climate to the cold, dry climate we see today. 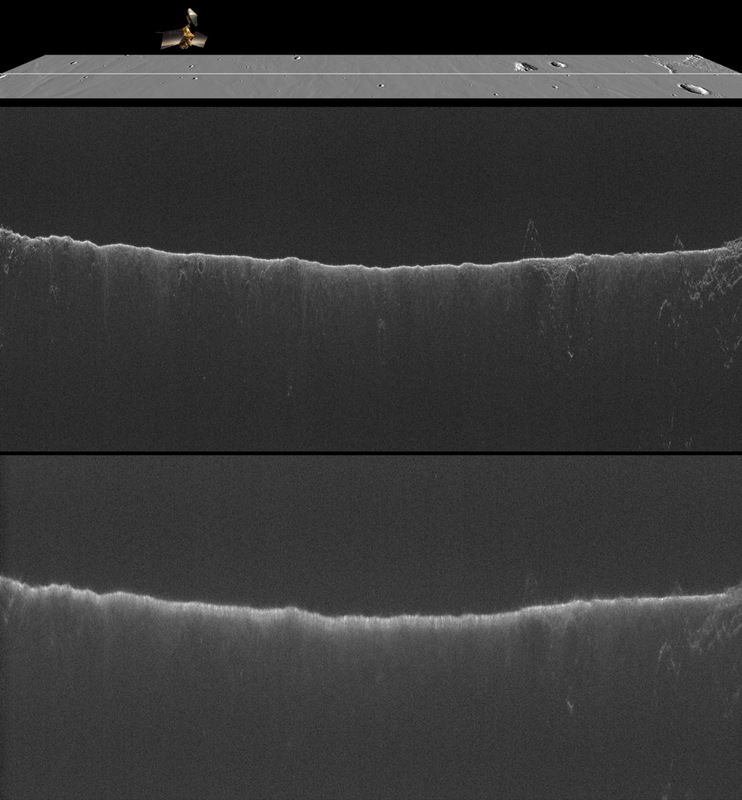 MAVEN observed the edges of the Martian atmosphere using the Imaging Ultraviolet Spectrograph (IUVS), which is sensitive to the sunlight reflected by these atoms. IUVS also created a map of the atmospheric ozone on Mars by detecting the absorption of ultraviolet sunlight by the molecule. There will be about two weeks of additional instrument calibration and testing before MAVEN starts its primary science mission. This includes an end-to-end test to transmit data between NASA’s Curiosity rover on the surface of Mars and Earth using the MAVEN mission’s Electra telecommunications relay. The mission aims to start full science gathering in early to mid-November. MAVEN’s principal investigator is based at the University of Colorado’s Laboratory for Atmospheric and Space Physics. The university provided two science instruments and leads science operations, as well as education and public outreach, for the mission. The University of California at Berkeley’s Space Sciences Laboratory also provided four science instruments for the mission. NASA’s Goddard Space Flight Center in Greenbelt, Maryland manages the MAVEN project and provided two science instruments for the mission. Lockheed Martin built the spacecraft and is responsible for mission operations. NASA’s Jet Propulsion Laboratory in Pasadena, California provides navigation and Deep Space Network support, as well as the Electra telecommunications relay hardware and operations.